During a reception at Avon Old Farms on Tuesday, the Canton Public School District honored those staff members who are retiring this year, as well as those who have served the district for many years. CANTON – On Thursday retired Cherry Brook Primary School kindergarten teacher Bev Kibbe received a surprise as she attended a ceremony honoring the lasting impact she and the late Dave Hutchins left on countless students. Kibbe learned that 2012 CHS graduate Miranda Jurras, who in the 1999-2000 school year had been inspired to follow her kindergarten teacher’s footsteps, had just accepted a kindergarten teaching position in Springfield, Mass. It was just one story of their lasting impact as school administrators, staff and the Cherry Brook Primary School Parent Teacher Organization formally dedicated benches at the playground facility to Kibbe and Hutchins. The benches are part of a multi-year, $187,000 playground project. Sadly Hutchins, who spent 16 years as head custodian, passed away in the fall of 2013 but the bench will serve as a reminder of a man who took pride in his work, was extremely friendly and upon his retirement personally said goodbye to every student at the school. He was also known to be impeccable with his work and long before it was commercially available, he devised his own way to retrofit a tennis ball on a pole so he could clean every streak on the floors. The Canton girls lacrosse team finished its regular season with a decisive 19 to 6 victory over Watertown on Wednesday evening. The team came off a difficult loss to Simsbury earlier in the week but finished the year with a solid win and 13-3 record. On Wednesday, the program also celebrated its seniors – Emma Charron, Sarah First, Amanda Gottlieb, Carly Atkinson, Devon Daubert, Kaelyn Oliver and Nikki Brightly – with pre- and post-game festivities. Next Thursday, the girls will begin conference tournament championship games as they hope to advance to the Class S tournament. Most of the seasons on the team, and several others, have played lacrosse together for years. Many came up through the Canton Youth Lacrosse program and Canton Middle School together. After scoreless fourth and fifth innings and trailing 3-2, the Canton Boys varsity baseball team rallied with a 6-run sixth inning to claim an 8-3 victory against Somers on Wednesday. Coach Greg Brisco said his team showed great composure, in part due to the fact that they had played so many games leading or trailing by one. 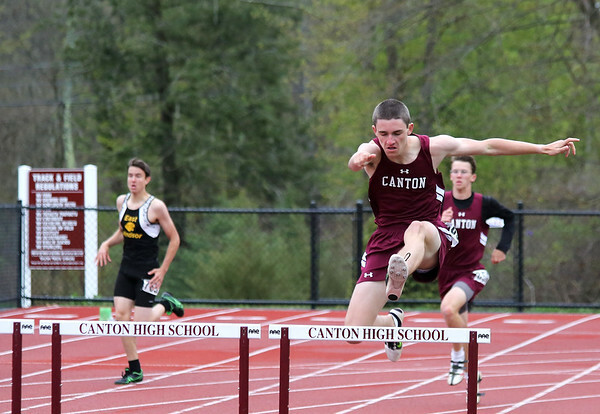 The Canton Boys track and field team logged victories against Suffield and Stafford this week to remain undefeated in the regular season for the sixth consecutive time. The girls also beat those two team to finish with an 11-2 league record this year. Both teams will be vying for a NCCC Championship next week. See more from our friends at collinsvillepress.com. CANTON — With an 11-8 win over Lewis S. Mills Saturday afternoon, the Canton Boys Varsity lacrosse team, for the first time ever, qualified for a CIAC Class S state tournament bid. The Warriors are now 7-8, with a recent winning stretch that included conference victories over Ellington and Suffield. The Warriors are learning to communicate on defense and show patience on offense, said coach Chris Weller. After dodging raindrops at a pre-event gathering, Canton Junior High School prom attendees were transported to the Gershon Fox Room at Marquee Events and Catering in Hartford Friday night. Capping off a night of fine dining, fun and dancing, Trent Sawtelle and Elora Rosedale were voted prom King and Queen by the 113 in attendance. Readers can also help keep Canton Compass operating by giving a donation at https://www.gofundme.com/canton-compass or via 15 Colony Road, Canton, CT 06019. The Canton Chamber is pleased to announce its 23rd annual Golf Tournament, being held on Monday, June 6 at Simsbury Farms Golf Course in West Simsbury. The tournament is open to the public and a portion of the proceeds fund the Chamber’s annual scholarships to Canton High School seniors seeking higher education in business or pursuing an entrepreneurial endeavor. BOSTON, MA — The following local residents have been named to Emerson College’s Dean’s List for the spring 2016 semester. The requirement to make the Dean’s List is a grade point average of 3.7 or higher. Katherine Hill of Canton. Hill is majoring in Journalism. Morgan Radocy of Collinsville. Radocy is majoring in Theatre Studies. Five Canton students were recently lauded for their approach to energy efficiency with first place honors in the 2016 eesmarts™ Student Contest competition. The contest, presented by Energize Connecticut in partnership with Eversource and the United Illuminating Company (UI), Connecticut Natural Gas, and the Southern Connecticut Gas Company, evaluates projects centered around efficiency, renewable energy and sustainability. The Canton students – Katlyn Campbell, Katherine Jarka, Nathaniel Savino, Paige Gnazzo, and Amaria Yancey – were one of four groups who submitted projects as part of Betty’s Hagymasi’s Conceptual Chemistry Class. Not only did they get the honor of first place, a plaque and an Amazon gift certificate, but will receive $1,500 toward implementing their plan.